There was a change in the weather over the weekend. Not quite f oul winter weather but a hint of weather in the air, you could smell it. I met Peter on the docks at Bald Head Island early Sunday morning to catch the falling tide in hopes of catching the Cape Fear Coast redfish as they got more concentrated with the tide. Peter and I had strong winds to contend with early and rather than make a long run we stayed close to the creeks at Bald Head and worked our way into the shallows and fortunately finding some sight fishable reds in a small lagoon in the back of a small creek. 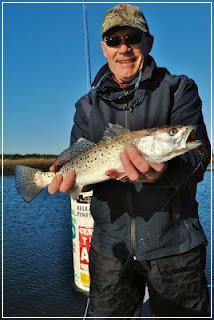 We still had some clouds to contend with and the fish had the drop on us despite Peter's great casting. The wind began to dis sipate and we decided to hit the open water flats in search of a school of redfish that have been feeding well. We slowly positioned the skiff on the pole and got within striking distance with the fly and unfortunately couldn't get the fly in front of the fish before they "made" us. I still had an eleventh hour location in mind. Our last chance hero move proved to be a good one and Peter made short work of finding the fish with the fly. 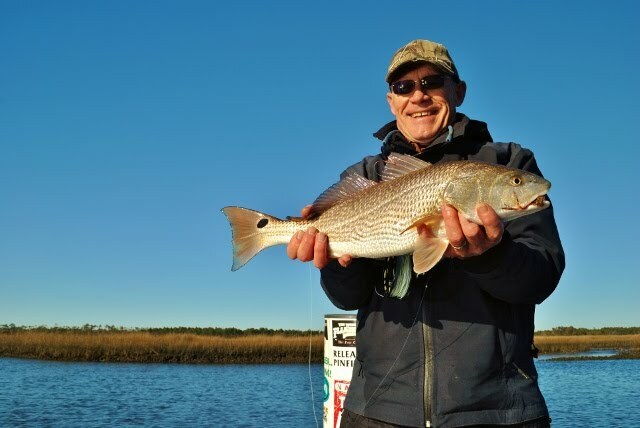 We sighted these fish pushing on the edge of some oyster beds when Peter unleashed a cast and as soon as his fly hit the water he was tight to a nice redfish. We were able to repeat our magic a few times and even drew a nice trout bite before it was all said and done. Altogether a really fine day of fishing considering the colder weather that had moved in on us. This has been an incredibly fair winter here on the Cape Fear Coast and we've had exceptional sight fishing on the fly and are looking forward to more adventures and fishing with friends new and old. Don't hesitate to call and book your adventure today!